This recipe uses oat bran and if you don’t normally keep it on hand, go ahead and buy some. I know what it’s like to buy an ingredient for one recipe and then never use it again. But I’ve already posted two muffin recipes featuring oat bran and now these pancakes. So you don’t really have an excuse not to try it! And since I like using it so much lately, I’m sure you’ll see a few more “oat bran” recipes popping up soon. 1. In a large bowl, whisk together all dry ingredients. 2. In a separate bowl whisk together, milk, sour cream and eggs. 3. Pour wet ingredients into dry ingredients and mix with a wooden spoon until just combined. Stir in melted butter and blueberries. 4. Drop pancake batter by 1/4 cupfuls (I just use a 1/4 dry measuring cup) onto a hot, greased griddle. 5. Pancakes are ready to flip when the edges stary to dry out and darken. Yield: 18 pancakes, 6 servings. Lovely pictures! They are making me realize just how hungry I am this morning. I wish I had the ingredients on hand! I'm with you about fat free sour cream. The less mysterious processing done to my food, the better. Oat bran ... of course! These are gorgeous. Hey Nicole ! The pancakes sound like a great Central Camp breakfast. I am going to make these the next time I go. My dad always made his pancakes from scratch, and I've had to resort to tweaking things (unsuccessfully) to lose the white flour and up the nutrition a bit.Now I know what I'm going to do with all that oat bran I have on hand (after giving a batch of breakfast bars a go).I must confess, I will add chocolate chips in along with the blueberries! Jen: Thanks, glad you stopped by! Let me know if you try the pancakes.Patricia: Thanks! I hope you like them :-)Quinn: Thanks for the compliment, nice to see you've stopped by again :-)Alanna: I'm so glad I tried baking with oat bran, it adds a great taste and texture along with the extra nutrition.Kathy: Yes, these would be good up at the cabin...maybe half with blueberries and half with banana! Of course my favorite breakfast up there will always be waffles!Scott: Let me know how the breakfast bars turn out! I need a recipe for some type of nutritious bar that is dense enough to be vacuum-sealed. My husband is deployed and I'd like to send him something through the mail but he wants something healthy. Also, let me know how the pancakes taste with chocolate chips (although I think I already know)! You've convinced me. Oat bran goes on my shopping list. I'm working on adding more whole grains to our meals and this is a fabulous, fabulous sounding recipe. That looks great. I've wanted to make blueberry pancakes but never got the chance. Now blueberries are nearly out of season. Sigh. ahhh, they look so delicious! perfect! thanks for working on it - I will definitely try them! =) and nice you put the nutrition info with them! Tnx! A question, really two ... is the sour cream an essential ingredient? And, how does it work as regular pancake recipe without the blueberries? Thanks! How I would love a stack of those right now! wow, those look amazing! i actually made pancakes this morning and felt bad that i didn't have any blueberries to add. and now i see what i missed! i'm cursing myself for not going blueberry picking this summer! There's nothing like a stack of fluffy (homemade from scratch) pancakes on a Saturday morning. I like that you made them "healthier" than the traditional pancakes. These pancakes look amazing! I'll have to try to make them sometime! Dh is absolutely crazy for blueberry pancakes. I make them regularly. I'll have to try your recipe and see what he thinks. We make our own blackberry syrup every year and dh carefully hoards it all for his blueberry pancakes, sharing reluctantly when forced to, lol!It is an incredible combination! Anita,I'm sure the buttermilk would work fine! And yes, these are great for lunch and dinner too! I know because I was eating them for a week after I made them! They taste great at room temperature too. And they also freeze well. I froze them in single servings (3 pancakes) and then I reheat them in the microwave. They taste just as good reheated which is kind of unusual for a pancake I think! Hi! Just Blog hoppin today and stumbled upon yours. Very nice! I provided my link incase you are web surfing anytime soon and want to swing by. Recipe looks fabulous! 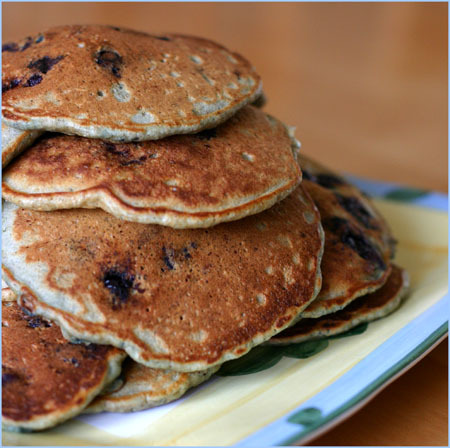 I'm always seeking ways to make pancakes, my comfort food of choice, more healthful. This is my first visit to your blog, can't wait to explore. Question: Would you mind sharing how you create the Nutrition Facts box? Is there a template you use? Thanks. Sour cream? Do you mean like buttermilk? Hard to get hold of in the UK but they sometimes have it at the supermarket.I've bookmarked your site because there's so many yummy things on here I want to go and make. Diane:I would substitute plain whole milk yogurt for the sour cream. I'm not sure if there is a sour cream equivalent in Europe. Weekends are a big breakfast deal around here, since we know Daddy will be here to enjoy. I am definitely adding these to my list! They'll be great to freeze for a quick weekday breakfast too. They sound great! Hi! I am new to your blog and am so glad that I found it!! Do you think frozen blueberries would work well with this recipe, or would fresh be better? Thanks! I also wanted to ask what kind of camera you use, your pictures are amazing. Kristen: Glad you stopped by! 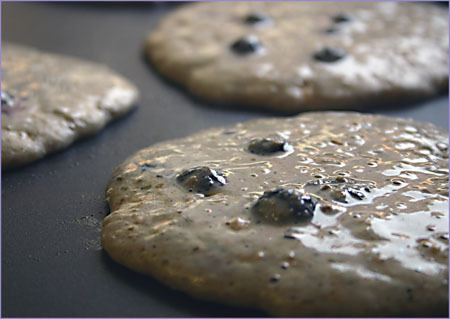 I always use frozen blueberries for my pancakes and they work great! The camera I use is a Canon EOS 30D (there's a newer version called the 40D now). Can't believe that I found this recipe again, I have been making it from a printout for a couple of years now, and that piece of paper somehow dissapeared! Thank you Google!! I am going to have add this blog my reads. I actually started substituting ground flaxseed meal for the butter at a ratio of 3:1 so 1/4 c + 2 T of the flaxseed. They still come out incredible and are even healthier yet. I always make a double batch and freeze them in packs of two, don't know how long they will keep in there because I eat them too fast!Thanks for the great recipe!! Hey Nicole,Do you think I could sub plain yogurt for the sour cream? Would it be the same amount? Let me know what you think.Thanks! Thanks for publishing this yummy recipe! Pancakes are my favorite thing to experiment with and I'm always looking for ways to make them healthier. I made these today and my husband has declared them his new favorite. I had some pecans left over from the holidays so I added them and the blueberry-pecan combo was so good! jsutkrish:I substitute plain nonfat yogurt for milk in a lot of recipes. It comes out tasting like you used buttermilk but with no fat and more protein. Using the same amount of yogurt as you would milk works fine, and I would guess that sour cream and yogurt are interchangeable as well. When I get around to trying this recipe, I will probably skip the milk and sour cream and use 2 cups of yogurt instead. I love oat bran! It makes really delicious oatmeal -- in fact, I prefer it to regular oat meal! Mix it with some salt, brown sugar, and cinnamon!